Women's Clothing, Men's Clothing and Children Clothing, Something for Everyone, Est. 1934. During the late 1920’s, into the 1940’s many people arrived to Indian River by train, and the train depot was directly across the street from the store. Sam McClutchey, originally from Onaway, began attending Central State Teachers College (now Central Michigan University) in Mount Pleasant, Michigan in 1925. While studying, Sam was a star basketball player for Central. It was noted in a year book that, “Sam “Hook” McClutchey was the greatest all around basketball player that ever wore a Central State Uniform.” While traveling back and forth on a train between college and home, McClutchey took notice of the small mercantile store across the street. At that time, the Oosting family owned the building. After four years of studying and playing basketball at Central, Sam graduated with his teaching degree in 1930. He went on and received a teaching position in Evart Michigan in 1931. At his new teaching job, he met and fell in love with Donna Bess Turner, of Evart. The couple was married, bought a house, and moved to Indian River in 1934. Sam then got a teaching job at Indian River’s school. At this same time, the couple bought the little store across from the train depot that Sam had admired for so long. All it took was a down payment of $150! Soon after, they became attached to Indian River. In 1936, they had their first child, a daughter was born, Mary was her name. Five years later, in 1941, came a son, William. 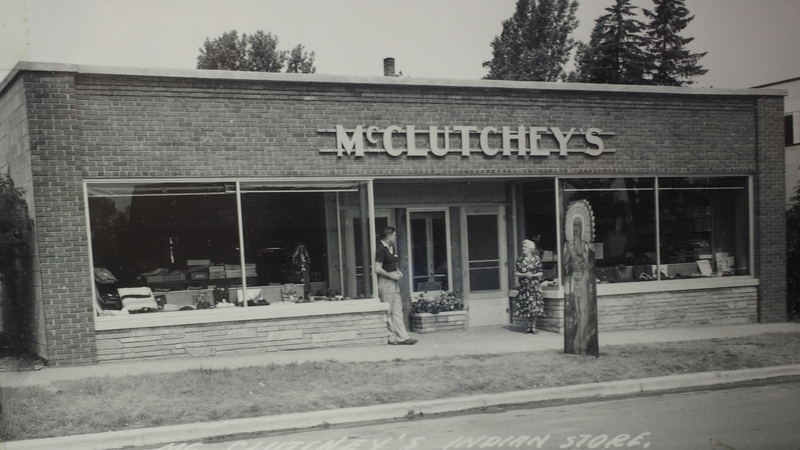 The McClutchey’s business originally consisted primarily of yard goods and small items. After a few years and a few expansions, the McClutchey’s established a full-line department store, which is what we have today. In 1942, Sam was offered a superintendent position for the Pellston school. Donna Bess also received a job at the school as Sam’s secretary. They had employees who would handle the store during the week, and they would come back to work on the weekends. During this time, Donna Bess gave birth to two more daughters. Kathryn was born in1951, and then Patricia in 1953. The family of six continued living in Pellston and commuted back and forth to Indian River for 19 years. In 1961, the two retired from Pellston to operate the store on a full-time basis. Sadly, a few months later, Sam died. After his death, the store continued on. The four children would help tremendously, and Donna Bess certainly knew business, so the store continued to grow. Donna claimed, “My children are very important to me, they are close by and they also help me run the store. If I ever need anything, they are always there for me.” The store carried on and was run by the family with a few additional employees to help during busy seasons. Donna Bess remained very active in her community. The children continued carrying on family traditions. Patricia became a teacher at Inland Lakes Schools in Indian River, Bill was a teacher at Petoskey Middle School, Mary was a school secretary in Flushing, and Kathy ran the store with her mother. In January of 1995, Mary passed away unexpectedly. Bill died in February of 2001. Donna Bess passed away 9 months later in November of 2001. Left with each other, Kathy and Patty had huge shoes to fill. Thankfully, Kathy learned strong business skills working next to her mother growing up. Kathy continues managing the store. However, doing it now from an owner’s standpoint. Patty learned the books and continues to be the store bookkeeper to this day. As of 2006, another generation has come into the store. Kathy’s daughter Samantha is now a business partner with Kathy. Samantha studied Retail Management in Grand Rapids and is now in the store full-time. McClutchey’s has something for everyone. Men, women, and children are sure to find just the right thing. We offer great fashions from Pendleton, Woolrich, Columbia, Tribal, Brighton, and Nomadic Traders just to name a few. We offer a ever growing selection of products proudly Made in the USA! We’re open all year and seven days a week from mid-June until Christmas. Stop in to say hi, surely you’ll become part of our family tradition!